Entrepreneurship has never been more important than it is today. It is widely acknowledged that new companies and entrepreneurs are important for innovation, job creation and economic development in Europe. However, traditional education and training systems in Europe have not been supportive of entrepreneurship and self-employment. As attitudes take shape at an early age, education systems should contribute more to the development of entrepreneurial skills and mindsets. 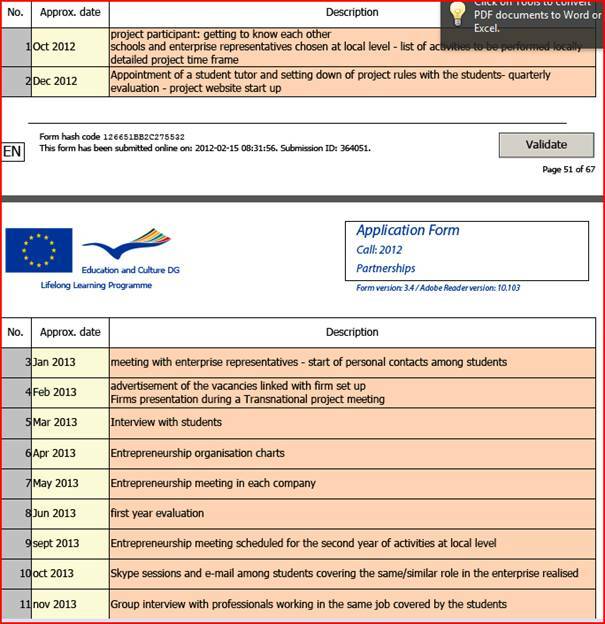 We want to run this project because: student participation is limited; teaching methods are ineffective; the practical element of entrepreneurship is missing; teachers are not fully competent; entrepreneurship is not linked to specific training subjects or professions; business people are not sufficiently involved. The PRO-ENT project is intended as a support tool for fostering entrepreneurship within the younger generation. This is to be achieved following specific project planning lasting 2 years and involving both schools and company representatives. The project aims to motivate pupils to develop creative, positive and innovative attitudes towards entrepreneurship. Project activities will demonstrate to them the relevance of education in the workplace and help them to develop both an enterprising spirit and a sense of personal responsibility. The partnership fostering the project is composed of 10 partners, extending over many European countries. All of them, with the addition of other significant local stakeholders, will be actively involved in project development: the activities’ impact could well prove definitively relevant. All the participating institutions will perform the same activities with the help of firm representatives in the case of schools or with the help of educational organisations in the case of enterprise representatives. 9) sustain a positive entrepreneurial spirit throughout the project. Every partner will have a Skype address, so that conferencing will be easy, making communication to exchange information or to talk about problems quick and direct. In the first month of the project a project website will be launched with the main information about the project, the status, and a collection of open material and results. It will be connected to a weblog were the partners can also communicate easily. The website and the platform will also be used for external communication and information. Several devices have been marshalled to ensure effective communication among the project partners. The most important are: general project coordination by a proven and experienced organisation, appointment of a specific Project Manager for each organisation so as to oversee project implementation, appointment of a specific student tutor to carry out activities with students, clear roles assigned to each organisation involved, frequent transnational project meetings convened, widespread use of internet tools, such as e-mails, Skype sessions and social networks planned among organisations involved and project participants. Every project partner is involved in the evaluation process, especially in the evaluation process for the whole project. The partners have to bring in their arguments and share opions and views on career orientation as well as on the project and its benefit. In addition to that all partners will be integrated in the management of the project. 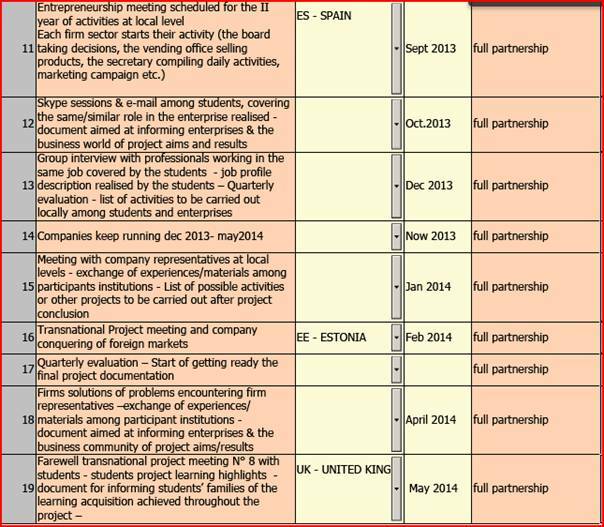 This is useful because they all are involved in financing aspects as well as in the workshops and their structures. Moreover they all are participating in their national reporting and the common final project report. The learners will be involved in all project experiences planned: from enterprise drafting, to its realisation, organisation and daily running. Learners will also be involved in the mobilities planning and realisation. Furthermore, monitoring and evaluation of all aspects of the project (mobilities, outcomes, activities, learning experiences, etc.) will be based upon the active involvement of students and student tutors. In regard to schools, the project will be incorporated into the time frame destined to project activities and/or orienteering activities, careers planning or links with the labour markets. For enterprise representatives, the activities will instead be linked to enterprise promotion and links to local and European development. All together the project partners at the project’s commencement will set the indicators to evaluate success criteria for enterprise education. These indicators will be monitored during project development and analysed in the final report and during quarterly evaluation moments scheduled during project implementation.